In January 1954, Honda dominated the Japanese market. The company launched the Juno K, a scooter designed to compete with the Silver Pigeon and Rabbit produced by the big Mitsubishi and Fuji industrial groups. With a 198cc (65x57 mm) engine developing 6.5 hp @ 4800 rpm, the Juno had impressive bodywork, which explained the great weight (353 lbs) of the machine. Powerful enough – its rivals developed less than 5 hp – the Juno K was excessively heavy and this rook the edge off its performance, for the 200cc Silver Pigeon and Rabbit weighed less than 310 lbs. Moreover, they were cheaper to produce ... and reliable. That wasn't the case with the Juno, which was not only too complex, but also cost a fortune in warranty repairs. The financial state of the company, in full growth up to then, was within an ace of failing. Honda could not have chosen a worse time: The Korean War had ended the previous year, and with it the off-shore procurement program by the American forces formerly based in Japan. The country was getting poorer, while the enterprises which had been involved in the war effort – among them Suzuki and Yamaha – were diversifying, particularly into motorcycles. Since Honda was also heavily in debt in 1953 (25 times the firm's capital was owed! ), the "Juno Affair" called for desperate measures – the bike was discontinued. 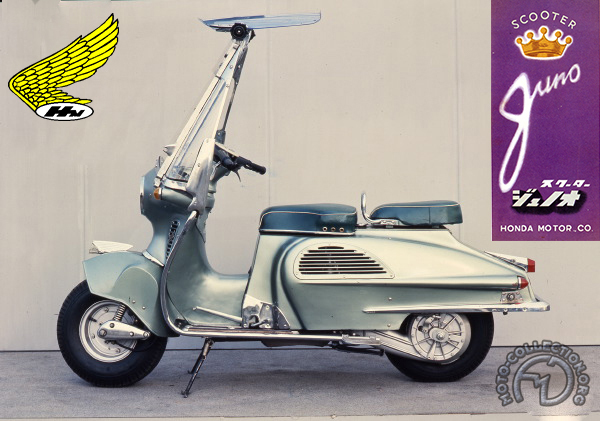 The Juno scooter contributed to the first major crisis in Honda's history, when the firm only narrowly escaped foreclosure of its bank loan.